Pushkar is well-known Hindu pilgrim. The place is quite famous among the tourists these days. The bewitching town of Pushkar is located on the edge of desert. Ajmer which is one of the best tourist spot cities is just merely 11 km from Pushkar. Travellers can stay at Ananta Spa and Resorts which is one of the ideal 5 Star Hotels in Pushkar. The property is situated at Village Leela Sevri on Pushkar Road. This lavish hotel/resort offers in well-groomed rooms that are classified as Classic Room,Deluxe Room and Superior Deluxe Room. These thoughtfully crafted rooms are filled with all contemporary amenities such as cable TV, bed, ceiling fan,spacious wardrobe, mini bar and many more. These well-furnished rooms are having attached private balcony that is peeking through a plush green area out-side the rooms. Guests can view the breathtaking view of the Aravali Mountains from their balcony. Rooms are having attached bathroom with cubical/open shower area. 'Oasis'is multi-cuisine restaurant that serves mouth-watering delicacies that pleases every plate in premises.Guests can enjoy the re-creational activities like swimming in the outdoor swimming pool, refreshing massage treatments and rejuvenating therapies in in-house spa -'Mudra'.There's a bhanwar singh palace which is synonym of luxury and extravagance. The hotel is listed among the lavish 5 Star Pushkar Hotels. The majestic property is a perfect spot for epicurean where they can get all sorts of gourmet amenities that make their stay as lavish as ever. The well-groomed rooms are appointed with all charm and facilities that is mandatory for the gastronomic stay of guests. In-room amenities include AC, giant spongy beds, intercom, coffee make, mini fridge, safe, room heater. By paying some extra charge patrons can available snack basket, fruit basket, basket and many other facilities. Outdoor activities involve tracking, racking and cycling which can be organized on request by hotel. The property has a multi-cuisine restaurant with gourmet ambience. 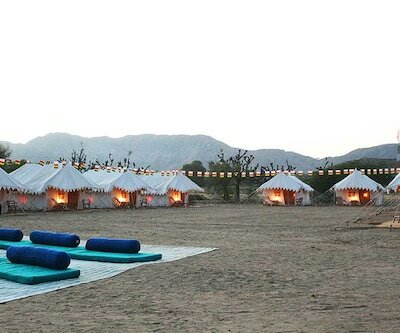 Refreshing activities include swimming, spa, massage centre yoga meditation and so on.There's a property named pushkar fort is one of the Best 5 Star Hotels in Pushkar that serves an array of facilities which make the stay of guests full of comforts and leisure's.